Let a little luxury into your life. 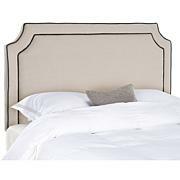 Lavish upholstery and expert tailoring create the aura of old world elegance in the Arebelle headboard. 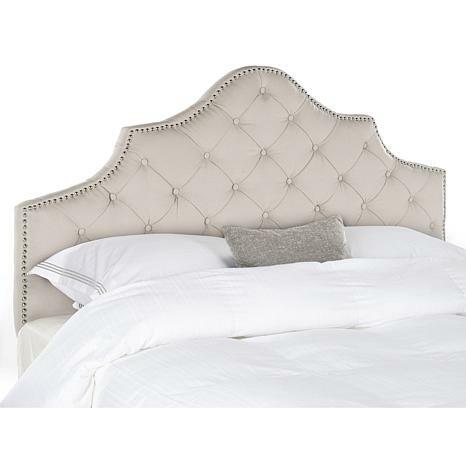 The classic camelback silhouette is outlined with silver nailhead trim accenting richly button-tufted linen fabric. It's just as posh as it needs to be. Care: To prevent overall soiling, frequent vacuuming or light brushing is recommended. Spot clean, using a mild water-free solvent or dry cleaning product. The use of steam or water-based cleaners may cause excessive shrinking or staining. Only a professional cleaner should undertake a complete overall cleaning. LOVE LOVE LOVE. Its exactly what I have been looking for. Beautiful but color is not as pictured. Its Grey! 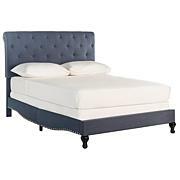 Axel Velvet Tufted Headboard Dress up a guest room or master suite with the deeply tufted Axel queen headboard. 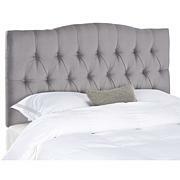 With posh button-tufted upholstery in lush velvet, this comfortably padded, gently curved headboard evokes images of 1930s Hollywood glam. And now you can enjoy it in your home.